Okay, so I have to admit that Day 30 was a bit anticlimactic. Even today, the day after when I’m free to eat whatever I want, it’s sort of like, okay now what? The one thing I did do different today was add a little bit of vanilla extract to my Primal Non-Dairy Coffee Creamer – thrilling, i know. (Vanilla extract isn’t recommended on the Whole30 because of the alcohol content.) I also added the teeniest tiniest bit of our homemade maple syrup to my coffee. I have to say, the vanilla was actually an amazing addition. The maple syrup was, meh. I think I was expecting a burst of sweetness to my newly re-sensitized tastebuds. However, I then remembered I have been eating fruit this entire time, so maybe my tastebuds aren’t as sweet deprived as I’d thought! I don’t need sugar everyday. But I do enjoy it and plan on enjoying it in the future. Deep rooted sugar habits – or any bad habits for that matter – can take longer than 30 days to kick. Cooking whole and fresh meals at home is the best way to reestablish a connection to food. Being such a big fan of Michael Pollan, this is something I’ve known for awhile now, but doing the Whole30 really hammered it home. With the Standard American Diet we’ve lost our connection to our food. So much of what’s on the shelves at the store, even the “all natural,” “healthy” stuff, is not food. What we consume is the biggest contributing factor to our body composition. Meaning, exercise alone won’t make you healthy. Prior to the Whole30, I did a 40-day commitment to being active every day. My muscles and endurance were stronger, for sure. But I managed to hover at the same weight and measurements prior to the 40 days. I’ve said it before that weight is no indicator of overall health. It’s just a measurement. And I stick by that. But there is something to be said about the fact that without any significant increase in my physical activity and by eating a ton of healthy food – more food than I probably ate prior – I managed to lose weight. Good food is powerful. Simplifying is the best thing for food stress. Prior to the Whole30, trying to figure out what to eat was stressful at times. Andrew and I would argue about what we were going to eat. Simplifying my options made things a lot easier and relatively stress free. Knowing there are just some things I don’t eat made going into the grocery store very easy. Sometimes, boundaries are the key to freedom. 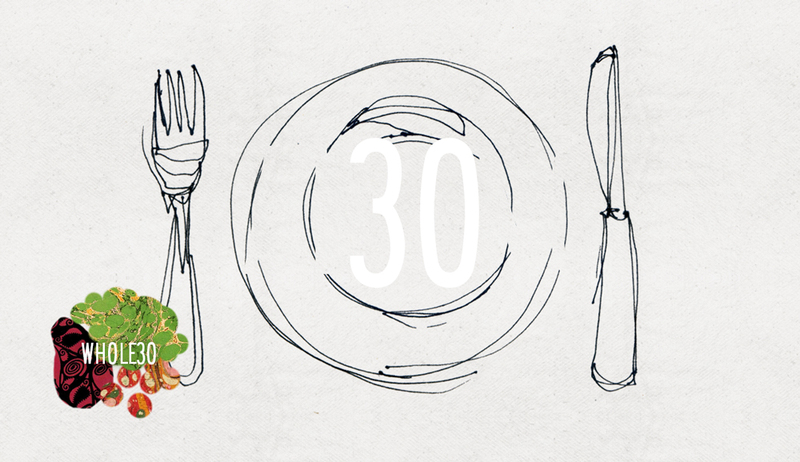 I realize, due to a lot of people’s circumstances, the Whole30 would be extremely difficult on so many levels, from the cost of fresh produce and high quality meats, to the time it takes to prepare meals, to something as basic as access to good foods. I am so thankful the Whole30 was even an option for me. I do plan on continuing to eat this way just not as strictly. I plan on introducing all the restricted foods back into my diet slowly and in smaller amounts than what I was eating before . Will I continue to use my non-dairy creamer? Yes. If I’ve found a great substitute to something I used to eat prior to the Whole30, I’ll just stick with the Whole30 version. If I go out to dinner and decide to have a dessert that includes dairy? Yes, no big deal. Will I be eating sugar everyday? Nope. I don’t like to think of this whole experience as a diet. Yes, I was choosing not to eat certain things. But I was also choosing to eat a diet of only the most nutritious, fresh and healthy foods available to me. There is nothing deprived or diet-like about that! The options are endless. I think the most important rule that I will stick with from here on out is: Do my best to avoid any packaged or processed food that includes added sugar or any soy products whatsoever. Those are two indicators that it’s most likely not good for me. And I don’t like things that are not good for me. Like my little sister doesn’t like pepperoni. It’s not a diet. It’s not like she’s on a no-pepperoni diet. It’s just not an option for her.